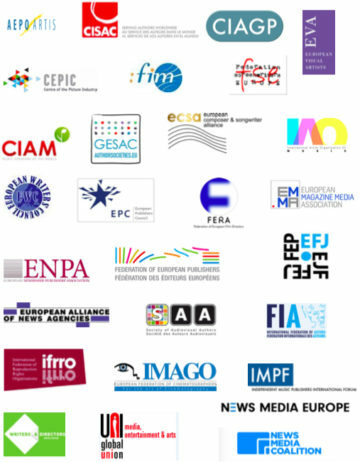 We, the undersigned organisations representing authors, performers, and others working in all artistic fields, news agencies, book, press and independent music publishers urge you to work constructively to improve and to adopt the Copyright Directive in the Digital Single Market at this week’s trilogue meetings. The current mandate from COREPER on Friday is a crucial step towards the Directive’s adoption, even though further improvements are needed to make the text truly meaningful for the cultural and creative sectors. This Directive has been long sought to create a necessary level playing field for all creative sectors in the European Digital Single Market, whilst giving consumers better access to more content in a secure environment. Without the Directive, creators will be left with no guarantee of obtaining a fair remuneration online and our sectors will be subject to great legal uncertainty regarding future practices. Failing to adopt the Directive would mean missing a historic opportunity, be extremely detrimental to European culture, and also represent a fundamental failure for European policymaking. The time has come to make the final effort to improve the text and reach an agreement at the trilogue. It is time to show that the European Union cares for its citizens, creators, values and cultural diversity and can stand up to protect them. We trust that your thoughtful political judgment and sense of fairness will prevail to bring this legislative process to a successful conclusion.